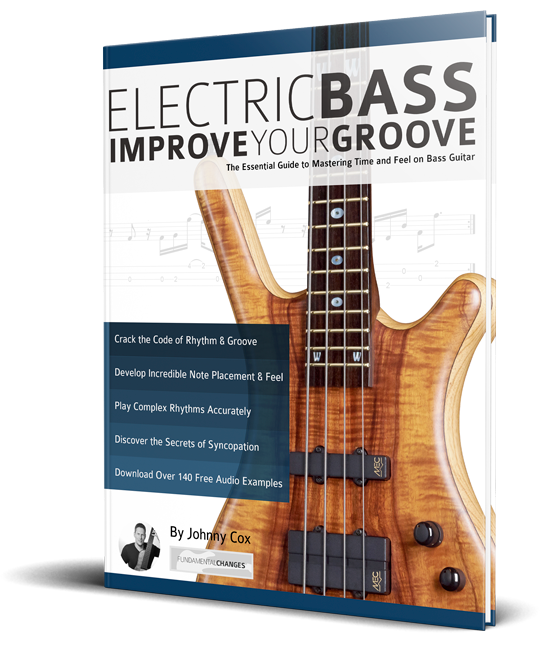 In this video lesson I’ll demonstrate off-beats bass grooves and explain how you can improve your groove by playing off-beats very accurately. Where’s the one? Is a question I often hear when I’m teaching rhythms like the one above. It usually means that the bass line in question either doesn’t accent the first beat of the bar, or in this case, doesn’t play on beat one at all. Bass players shouldn’t define their grooves by beat one, the example above contains four beats and four off-beats in each bar. Every beat and every off-beat is equal, and you must know how to place notes accurately on any of them if you want to have a great groove. Beat one isn’t more important than any of the other seven sub-divisions. The key to making the bass line in the example above groove is the ability to play the off-beats very accurately. Most people can play accurately on beats but playing on the off-beats is harder. The following example was written to help you practise playing on the off-beats. The first note of each bar is on beat one and the remaining notes are played on the four off-beats. How do you improve youroff-beat groove? When you practise the examples above, make sure you play the off-beats very accurately. In order to do this, start by playing slowly in time with a metronome or drum beat. You can find these for free online. Then say Ta-Ka in time with the beat. Ta is the beat and Ka is the off-beat. If your off-beat notes land exactly on the syllable Ka, then you know your timing is good.